In December we released the application we internally call KTH Publications. What it does? 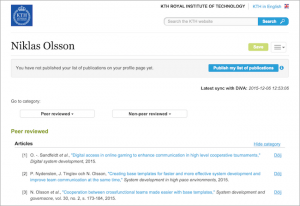 It adds the researchers publication lists on their profile pages which makes them both searchable and more visible at KTH.se and the web in general. When the researcher enters the publication list administration interface for the first time he/she will see the list almost as it will be presented when it is published on the profile page. The only difference is the menu, the publish button and the links for hiding publications. Now the researcher can go through the list and publish it when he or she is satisfied. 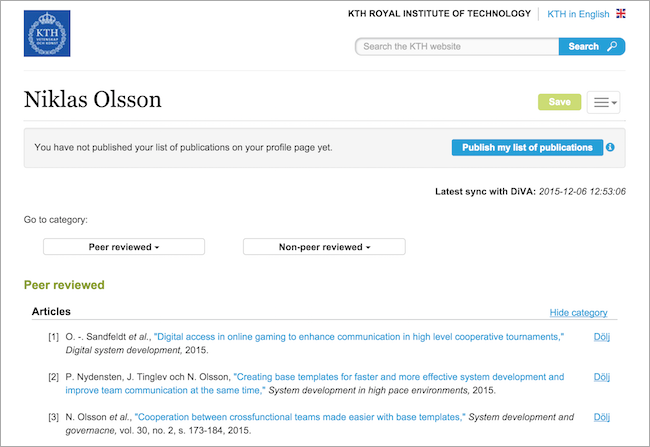 If you are a researcher at KTH and has not yet published your publication list, follow these instructions: Lists of publications on profile pages to make your work visible and searchable via www.kth.se. If something is missing in the publication list or wrong in some way, the researches can add or edit the publications in DiVA or contact the Publication Infrastructure (PI) department if they need any help. The web application is build in two parts, an api which handles the communication with the MODS API of DiVA and the local database, and the front end web interface which contains the views presented to the editors and visitors. The api is publicly available at www.kth.se/api/publications/swagger and is used by the front end to get or set data. Some end points are accessible without authentication but most of them are. Checkout the Swagger view and test it. There are a lot more to be done in this area around research data visibility and information but I’m glad that we got this out in public. What’s next? I don’t know…the future will tell. My name is Niklas and I work as a IT Solution Manager in the team responsible for our main CMS, blog platforms, search service and more. I use this blog to share information about new projects and systems that we develop for our users at the university. Hi, my publication option in the profile editing mode is missing. Can you help fix the problem? Yes, I can help you. I will contact you via e-mail.